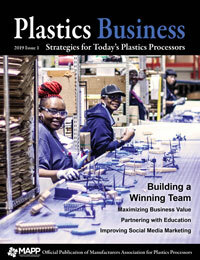 Team 1 Plastics, Albion, MI, has reached 5,000 days without a lost time accident. It has been almost 14 years since Team 1 recorded its last lost time accident, which occurred on Oct. 20, 2000. The accomplishment reinforces its commitment to “Team Member Success” and a focus on creating a safe work environment for all its team members. Team 1 Plastics is planning a 5,000 safety day celebration, during which a special gift will be given to each team member. For more information, visit www.team1plastics.com.